Rick Nash peaked in a decade ago. But for some reason, teams treat him like he’s a one of a kind player. Based on his salary alone, one would think he’s the most iconic left wing of the century. Nash is a mediocre player, who, for some reason, is treated like an idol. And it’s been getting to his head. Earlier this month, Nash sent in a list of 18 teams he didn’t want to be traded to. He could sense a trade might be coming, since his huge salary was holding the New York Rangers back from doing anything productive. Nash is being treated like he’s still a top pick in the NHL Entry Draft like he was back in 2002. Alert the media, it’s not 2002 anymore, and not every top draft pick ends up playing the career they predicted. Nash’s intuition was right, and he was traded to the Boston Bruins on Sunday. The Bruins also signed 39-year-old forward Brian Gionta, who was formerly on the Buffalo Sabres, to a one-year, one-way contract. Buffalo chose not to renew his contract during the 2017 off-season. So with some extra time on his hands, Gionta was just in Pyeongchang playing in the 2018 Winter Olympics and captaining Team USA. On its surface, the Nash trade might seem like a good move for the Bruins. Nash can play on a line with center David Krejčí and add some depth to the second line. He’s a veteran guy and has playoff experience. That would make sense if it was a different player, but Nash can’t and won’t be that guy for the Bruins. Gionta could fit in well with Boston’s mantra and playing style. Nash certainly doesn’t. Since the 2013 Stanley Cup Finals when the Bruins lost to the Chicago Blackhawks, Boston hasn’t been able to make much ground in the playoffs. The Bruins might just be looking for ways to make it past the second round of the playoffs. But this attempt seems a little desperate. There’s no doubt that Boston lost in this round, but a quick look over to the Rangers’ locker room tells a completely different story. Yes, it seems a little empty right now, but this is a rebuild that was well overdue. 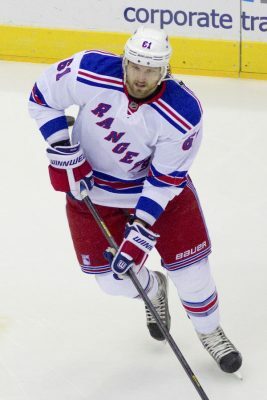 Despite trading captain Ryan McDonagh and J.T. Miller to the Tampa Bay Lightning, New York needed the purge. And the Rangers still have a good, core group. Jimmy Vesey, Pavel Buchnevich and Kevin Shattenkirk are all hitting their strides as relatively new additions to the roster. New York certainly dodged a bullet with a potential Rick Nash debacle. He was getting a little diva-ish, especially with that no-trade list. In that situation, it’s always good to take a page from New England Patriots head coach Bill Belichick and cut out the nonsense. Calling him a diva may be a bit of an exaggeration, but Nash isn’t worth all the money the Bruins are paying for him. Yes, it’s half of the contract from the Rangers, which is a great discount, but Nash comes with a lot of baggage. There’s no way to spin it. Boston lost in this deal. Yes, the team might get to round three of the playoffs this year with this little boost, but it won’t last. It’s not a stable relationship. The Bruins should learn from New York and start a rebuilding process for themselves. Nash is more of a rental property than anything for the team. If it doesn’t work out, he won’t be there for long. Bottom line, Nash is better suited in a lower-level NHL team. The Bruins don’t need the veteran leadership of Rick Nash right now. They don’t need the distraction before they head into the playoffs. Maybe Buffalo or the Ottawa Senators would be better Atlantic Division fits for Nash. And if not an NHL team, Nash would probably be best suited for the AHL in the last few years of his hockey career. You definitely sound like you have a personal vendetta . The one who can prove you wrong is on the ice for the Bruins until he’s not. You know what they say about opinions? It’s obvious you know nothing about hockey, especially the Bruins! Was the regular hockey writer too sick to do their regular job? Ottawa is bailing out and Buffalo is on the bottom, so why would they want someone like Nash? Also the Bruins are in the top 5 best teams while using 8 rookies to help! If that isn’t rebuilding I don’t know what is! I hope you are better at your regular job and leave the hockey stories to real hockey people! Holy crap welcome to fiery hot take town. Are you serious with this garbage? Do you have any concept how no trade and modified no trade clauses work? From a contract signed and negotiated by Columbus? Nash finishing his career in the A? Be honest, you were super high when you put pen to paper here. This is the biggest piece of trash article I have ever encountered. The person who hired Jessica should be fired. What in the world are you talking about? NASH is 100% not worth his average salary cap hit anymore. Almost every single word other than that was pure nonsense. I came to this article to learn about the deal. You didn’t even mention what/who he was traded for so that readers can compare for ourselves. Mentioning nothing but bad things about Nash. I guarantee you that Nash will help the Bruins. What kinda dumbass says his leadership isn’t needed. Are you joking? The Bruins are destroying the league right now and your saying they need a rebuild like the rangers?? I never comment on stuff like this. I am offended on behalf of Rick Nash, the Bruins, the Rangers, the NHL, hockey fans, hockey writers and anyone with a brain. Sure the Bruins may have lost the deal as a whole – if he averages a point every other game in the playoffs I think they’ll be content. Any team that trades for a veteran on his downside generally loses the deal long term. Watch the sport, read a book. Stop writing gibberish assuming grammer and spelling will save you. Clearly someone hired Jessica so who’s to really blame for this huge waste of time? Don’t give up the day job. Both teams won on this one. Rangers need to start over and Bruins need veteran help and leadership. Seriously don’t know where you got your facts. As already stated by previous posters, this is one of the worst sports articles I have ever read. I am a Bruins fan and I assume you know nothing about our team based on the quality insight you provided in this article. Nash was picked up to play with center David Krejci and talented rookie winger Jake Debrusk. Krejci has always succeeded with a line of bigger players, going all the way back to Milan Lucic. However, with injuries and lack of size available lately, his ability to distribute the puck and work the mismatches that he is so good at, has been suffering. In comes the massively talented and sized Rick Nash, who you say is washed up and a horrible deal for the B’s, at half his salary. If you were right then one would expect the Bruins second line would be the same or worse in the 3 games he has been skating, right? Well in three games Debrusk has 3 assists, Nash has 2 goals and 1 assist and Krejci has 3 goals and 1 assist. I am not a hockey expert like you, but if that small sample size continues, which one would assume since they are just starting to play with each other, then they are on tap for a scorching offensive finish to the season. Oh and I am sure that the fact that the Bruins are one of the favorites for the playoffs has nothing to do with your obvious hate of Nash and our team in this article. Get a clue lady and stick to cheerleading, where biased opinions are encouraged! I am a Ranger fan and frankly hate the Bruins. But let me tell you, you will love Rick Nash. He has been snake bitten this year but hot recently. Two way player. Gets into the dirty areas…big talent. He will DEFINITELY help your team. This writer is an idiot. Good luck in playoffs. Like everyone else here, I agree. This girl is a completely clueless idiot.